The Bench comprising Chief Justice K. Sripavan and Justice Upaly Abeyrathne directed the parties to submit their Written Submission on or before Friday (1). Petitioner cited Special Investigation Unit (SIU) Inspector M.D.C.P. Gunathilake, its Director SSP Mevan Silva, IGP, Australian Brian John Shaddick, his Power of Attorney Holder Lasitha Indeewara Perera, SIU ASP Bandara, J.C.P. (Sydney) Jayasinghe and the Attorney General as Respondents. Romesh de Silva PC with Sugath Caldera appeared for the Petitioner. Senior Deputy Solicitor General Ayesha Jinasena appeared for the Attorney General. Manohara de Silva PC appeared for Sydney Jayasinghe who is now arrested and in remand. Amarasiri Panditharatne with Sanjeewa Kaluarachchi appeared for Brian John’s Power of Attorney Holder Lasitha Indeewara Perera. Petitioner in his petition seeking the Court to grant leave to proceed for the alleged violation of his fundamental rights to the freedom from torture, right to equality and equal protection of the law, freedom from arbitrary arrest and detention. He is seeking a declaration that the Respondents and/or the State has violated his fundamental rights. He also seeking another declaration that the decision to arrest and detain him is violative of his fundamental rights. He is asking for a declaration from the court that the decision to institute proceedings against him based on the alleged complaint made by Australian Brian John Shaddick is illegal. He is asking the Court to issue an interim order directing the Respondents and/or State to release him or enlarge him on bail subject to conditions. He is asking the Court to award him a compensation of Rs. 500 million from the Respondents. Petitioner bemoans that in a bid to politically harass him, the IGP and the said foreigner an Australian Brian John Shaddick had made false complaint against him at the behest of his political opponents. 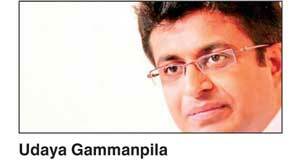 Petitioner Gammanpila claims that he played key role in the Joint Opposition in the present Parliament and a key member of the Joint Opposition.